I have launched a new blog. Yep, another one. (Don't judge me. 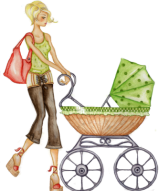 I am well aware that Cupcake & Company's web site and blog are still not completed. Maybe I have adult ADD, but I've digressed already...) This new blog is where I can document my crafty-type things and not clutter up our family blog which is and should be all about Amelia. Right? Have you seen this little monster in monkey pajamas? If you have, approach with extreme caution. She will steal your heart and demand "buttons" (Smarties) and "water" (milk). Ignoring her is futile; she is way too cute. Footnote: The other day, Amelia actually had THREE binkies in her mouth at once. I'm so sad that I missed that photo op! We stayed in the Kennedy Suite at Winthrop House with our traveling buddy, Flat Stanley. We introduced Amelia to Noch's where she devoured their pizza (as did all of the adults). For the record, the total number of cheese steaks and slices consumed over a four-day weekend set some kind of world record. This number, however, will not be published to protect the guilty. Sitting behind us on our flight back from Boston tonight was a super celebrity - BARNEY! (Adults, if you are lost, consult your nearest toddler. They know exactly who Barney is and will spontaneously break into song at the mere mention of his name.) Now, when I say that Barney was sitting behind us, I don't mean an over-stuffed purple dinosaur. I mean the man behind the mask, David Joyner. He played Barney for 14 years and is now Hip Hop Harry on Discovery Kids and was so kind. He even sang the clean-up song with Amelia and commented, "She's very focused. What a smart kid... and I should know, I've seen a lot of kids." So there you have it folks. Straight from the dinosaur's mouth - Amelia is smartie. (But you already knew that, right?) More about our Cambridge trip later. My resolution includes posting my latest creations. I'm always trying to describe them to my mother over the phone and I'm afraid my storytelling skills fall short. Plus, I find myself in some bizarre-o creative high gear right now. If I sit too long I start imagining what I can do to, say, the lamp sitting next to me or the shirt Amelia is wearing. So, why not post my successes and, dare I say, failures? Wait. Teishi has no "failures", just hiccups in the process. Right? 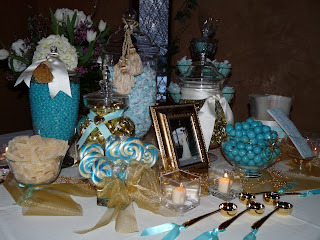 Just thought I'd post another photo of the candy buffet because it looks so much lovelier once the bride added a few final touches (flowers, her bag seals, etc.). My photo was taken a few hours before the final set-up so it was lacking a few things. If it's the last week of February, then Kennedys and company are meeting in Anaheim to enjoy the Happiest Place on Earth! This year we were lucky enough to have Amelia's nana, Jill, join us for part of the week. BIG thanks to the Moss family for suffering through seven straight days in the Park with us (Brennan - I'm sure we still owe you a chocolate shake), the Hatch Family for letting us drag them around for a night while we talked their ears off catching up (Brock - we get SERIOUS about Disney), and the May Family for just being the Mays. (Felicity - even as a very pregnant woman, you're amazing!). We feel so blessed to have such wonderful friends.